After demolition. 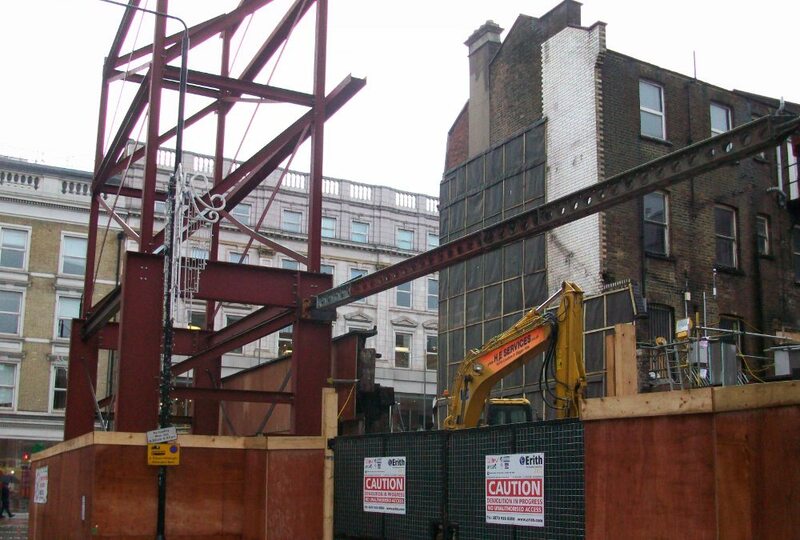 The retained 18th century facade of 1-3 Goodge Street became unstable. The facade of an 18th century building which was meant to be preserved had to be demolished in December after it became unstable. The building at 1-3 Goodge Street which was the subject of a campaign to preserve it was demolished in the autumn of 2013 but the facade was meant to remain and be included as part of the redevelopment of the site. Planning permission was granted on appeal by the government’s planning inspectorate overruling Camden Council who had refused permission to build the scheme wanted by developers Dukelease. Although Camden refused permission, they did so not because they wouldn’t allow the building to be demolished, but that the proposed design was unacceptable in the Charlotte Street conservation area. Camden’s conservation officers had recommended approving the demolition and the planning committee did not disagree with this. The reasons given by the committee for refusal were not the reasons wanted by campaigners, including the Charlotte Street Association. This then cleared the way for Dukelease to appeal to the government inspector on the basis that their proposal should have been allowed. In effect, according to Max Neufeld of the Charlotte Street Association, although Camden refused permission they consented to the demolition of the Georgian building — the oldest on Goodge Street — leaving only the facade. The inspector then allowed the appeal. The architectural historian and broadcaster Dan Cruickshank had backed the local campaign to save the building saying it was as an important heritage asset which contained many original internal features. 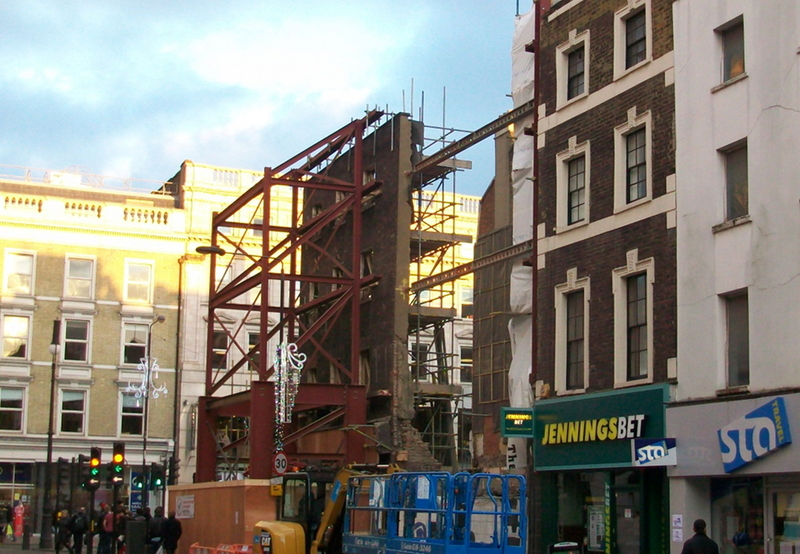 The facade of 1-3 Goodge Street held up by girders before it had to be demolished. The owners of the building wanted to keep the facade and demolish the rest of the Georgian structure, to create what critics called a “stage set” on this important part of Goodge Street. However, after the rest of the building was demolished the courses of bricks held up by girders soon became unstable and the owners were granted permission by Camden Council to demolish it on health and safety grounds. In a statement owners Dukelease Properties Limited said they proposed to “re-build the facade as a faithful and correct reproduction of the existing”. On 21 January they made a further statement. 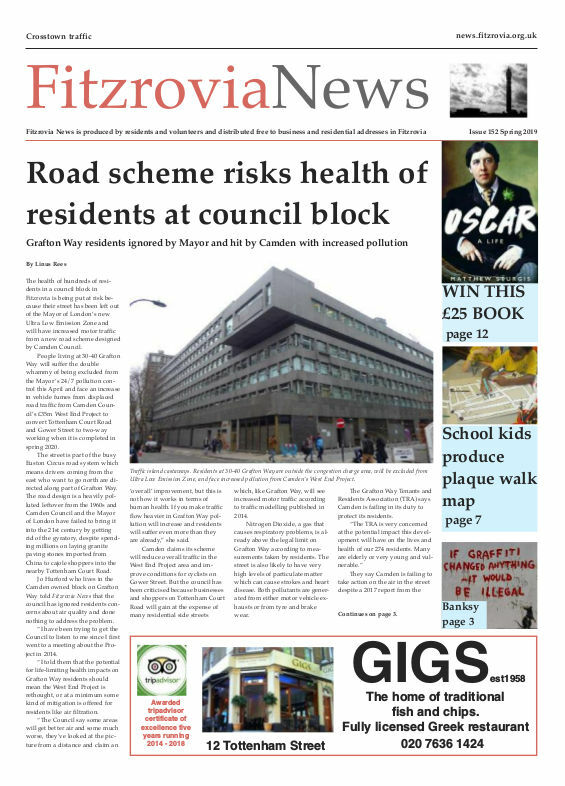 Editorial note: this article was corrected on Tuesday 28 January to make it clear on what grounds Camden’s planning committee had refused planning permission and conservation area consent, and on what grounds the inspector made the decision. Details on Camden’s website here.